A pretty little handmade vintage style fabric needlecase perfect for storing sewing needles. This would make an ideal gift for a crafting friend or loved one or even as a treat for yourself. Hand crafted from pretty brightly coloured butterfly print cotton on a cream background. 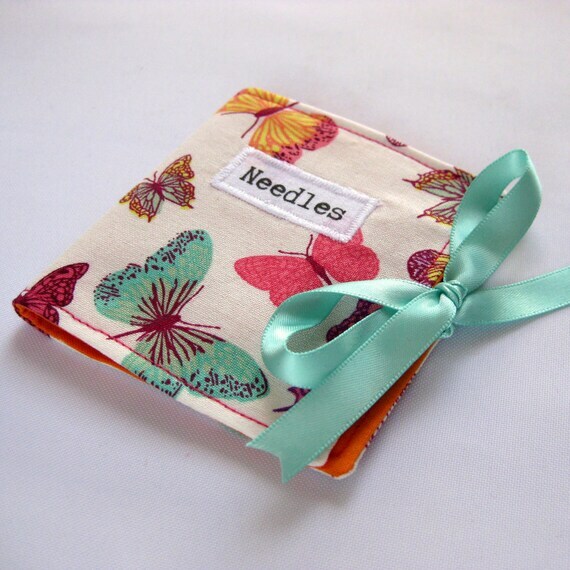 Features complementing orange lining fabric and four 'pages' of bright pink and yellow wool mix felt for storing your needles. The case fastens with matching mint green satin ribbon ties. The front is decorated with an applique patch which reads 'Needles' and has been printed by me onto white cotton fabric, bonded and machine sewn on. The needle holder has been interfaced for durability and reinforced with stitching complementing the colours in the fabrics.